One of my older brothers said that my blog is inspiring. He was talking about posting on his own site: greenegenes.net But, then someone else said that the picture of Caroline and I at the Ocean looks like one of those posters with a ‘hard-to-follow’ quote at the bottom. I have to say. There is nothing like having a child to remind us that there are wonderful things in the world. Furthermore, she is amazing to watch. 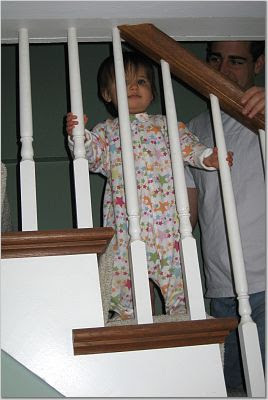 She can climb stairs, has started talking (not to us, in English, but talking nonetheless), and you can actually see her thinking (about things like: should I army-crawl or regular crawl, eat all the cheerios or one by one…). What I’m saying is, life is pretty amazing (and also pretty dark – but I’m not writing about that). I think I wish I were still learning and growing at the rate she is. My friends and family would certainly appreciate it I think. What is amazing to you? Even if today was difficult… What is beautiful?